← Eat Your Peas and Carrots (Risotto)! As much as we all love Chinese takeout, let’s face it – it can get expensive if you eat it too often and there are times that even when you get food from your favorite takeout place that the meal seems less than inspiring when you eat it. With that in mind, why not try to make some of your favorite meals right at home? Very often they are a lot easier to do than you think and even with all of the ingredients may cost less than what it would cost to get it from a takeout place. When I saw this Guy Fieri recipe for Mu Shu chicken, I wasn’t sure if I could pull it off since it involves making your Chinese pancakes, which are basically like crepes. As intimidating as the thought was, the reality seemed much easier and I wanted to give it a try. For the Mu Shu chicken: Whisk the hoisin, soy sauce, mirin, sesame oil, garlic and ginger in a mixing bowl. Season with salt and pepper. Add the sliced chicken thighs and toss them to coat them evenly with the marinade. Marinate the chicken, covered, at room temperature for 20 to 30 minutes. Once 5 minutes of marinating time remains, heat a large skillet over high heat and add 2 tablespoons of the vegetable oil to heat. Using a slotted spoon, strain the chicken and add it to the very hot skillet. Cook, allowing the chicken to brown, stirring occasionally, about 2 minutes. Add the red bell pepper and the onion slices, allowing them to soften, and cook for another minute. Next, add the cabbages and carrots and cook, stirring occasionally, until just browning, about 2 minutes. Push the chicken and vegetables to the side of the skillet and stir in the mushrooms, bamboo shoots and water chestnuts. Remove the skillet from the heat and set it aside, keeping the contents warm. Place a nonstick skillet over medium heat and add the remaining 1 tablespoon of vegetable oil. Add the beaten eggs to the skillet, allowing them to scramble, about 2 to 3 minutes. Once cooked, break up the eggs with a rubber spatula and add them to the chicken. Toss the mixture to combine. 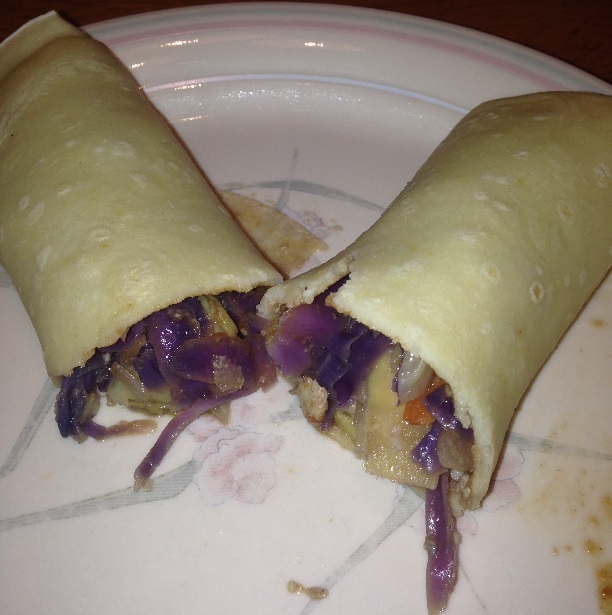 Spread about 1 tablespoon of hoisin sauce on each Chinese Crepes. Top with some mu shu chicken, sesame seeds and scallions. Add the cilantro leaves if desired. Roll up the crepe and serve with Sriracha if desired. In a medium glass mixing bowl, whisk the flours, salt, 1 cup of water, the sesame oil and the eggs; the batter should be smooth and free of lumps. Heat a 8-inch nonstick skillet over medium heat. Very lightly coat the skillet with nonstick cooking spray. Ladle in 1/4 cup of the batter. Gently rotate the skillet for a few seconds, swirling the batter to create a thin, even layer over the bottom. Cook the pancake until the underside is pale and just firmed up, about 1 minute. Flip the pancake over and cook for another 30 seconds. Remove it from the skillet and transfer it to a plate and cover with a kitchen towel. Continue with the rest of the batter until all the pancakes have been made. Keep the pancakes warm until ready to serve. This was a very tasty dish that was easy to make. Granted, there are a lot of ingredients involved and you need to leave yourself some time for some prep work to get everything together and ready to go so you can just cook. This is what you should do for every stir fry dish anyway because the actual cooking time is pretty small, usually smaller than the prep time. The taste of the sauce is fantastic and really adds to the chicken and there are tons of great vegetables in this dish. 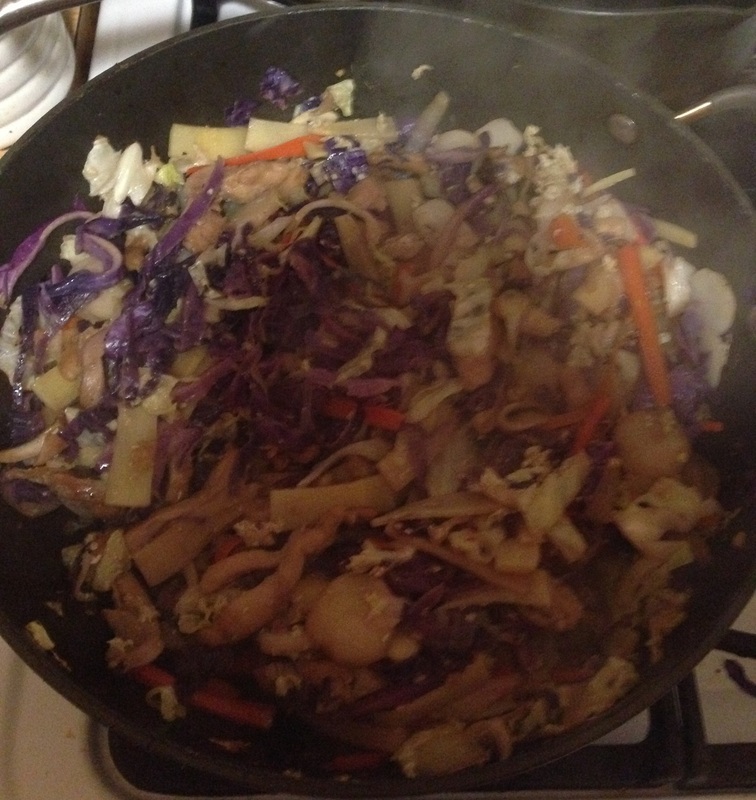 The crunch from the cabbage and the water chestnuts go great with the carrots and mushrooms and the chicken. As for the crepes, they were not hard to make at all. I only tore one in making them, and it was the first one I made. After that, I got the hang of it and make sure you let it cook the full minute before you try to flip it to make sure it flips nicely. Guy actually adds some sliced scallions to his crepes while they cook but I left them out this time since I was just trying to get them cooked successfully. I think they came out well and everyone seemed to enjoy them. I would definitely try making this one again. That’s all I have for today. Check back next time for another great recipe. Until then, enjoy the rest of your day and enjoy your meal!